In Sara’s post, I learned that she only recently watched The Emperor’s New Groove, which was one of my favourite movies as a kidlet. I feel like I need to rewatch it soon, though, because I’ve forgotten so much! OK, now this is a result I can fully get behind! Mushu is the business! I also learned a fancy new word for sidekick: deuteragonist. Phew. Quite a mouthful. Anyway, I’d love to have Mushu as my second-in-command because he’s hilarious and loyal. Gaston, huh?! So my greatest weakness must be that I’m blinded by my obsession with my looks? No, Derek, I never actually did. Juuuuust kidding 😉 I think Gaston is actually incredibly insecure and masks that insecurity with a façade of machismo. There are definitely things about which I’m insecure, so it’d be fair to call that insecurity a weakness! Similarly, feel free to do this even if you weren’t tagged, and please link back to this post so I can see your answers! 😀 Do your Disney characters suit you, or are they way off? What’s your zodiac sign – and what do you think of zodiac signs in general? Sound off in the comments! Previous Post The Ballad of Two Lovers. I want to watch the Emperor’s New Groove TV show again. That was sooo good and I can’t find copies anywhere. Izma (that spelling is definitely off) was the best! I KNOW, RIGHT?! 😂 Fleeeep I feel ancient at that knowledge! I never watched that TV show and now I’ve GOT to find it! I hear you about Princess and the Frog. It’s one of the more underrated and forgotten Disney movies. Also, Mushu is the best deuteragonist (didn’t know that was a thing either)! Love that Zoolander reference too 😂. Thanks for the tag, Hannah—I’ll definitely be doing it 😁❤️. This looks like a fun tag! Do you mind if I do it over at my blog? I’d b sure to link you! Oh Mushu is awesome!! Fun post! Yessss, he’s so great – he never fails to crack me up. Waaaah how am I Milo and not Hercules hahaha! Although at least I’m a linguist and adventurer! And you are my princess! Thanks for doing the tag! It’s so great that you got Mushu! I’d love to have him as a sidekick! I’m a Leo! Most of the answers I got for this tag were kind of off for me except Rapunzel. I can definitely see some similarities there. The way Leos are typically described definitely sounds a lot like me but I definitely don’t follow my horoscopes! Side notes: The Emperor’s New Groove is one of my all time favorite movies! And… I cracked up at the Zoolander gif! Oh yeah, I had to kind-of scratch around for relatable things here 😉 I know exactly what you mean – a few of my personality traits fit the typical descriptions of my zodiac (Aquarius) but I’m not really interested in horoscope stuff. 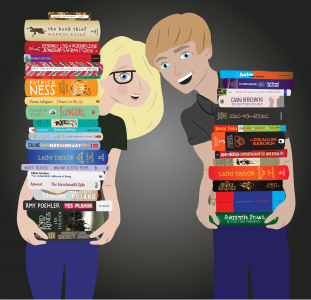 Welcome to our book blog, fellow fiction fanatic! Do you believe in love at first read? Want to crush the game? Smash the button and join the team!